Search by day, week or month to plug into all the great happenings in the Denver area. ThereÕs plenty of action 365 days a year in The Mile High City. Denver's dining scene is soaring with award-winning eateries and chefs making a statement with creative cuisine. Sort options by city region and category. The lodging boom continues in The Mile High City find out about recent hotel openings and several more planned through 2017. Skip the reading and head straight to videos that capture the many unique facets of Denver in 3 minutes or less! 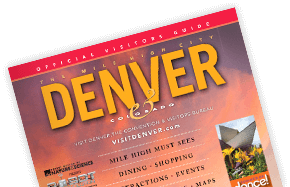 With the Mile High Culture Pass, you'll receive admission to the Denver Art Museum, Botanical Gardens and Molly Brown House Museum. Buy your pass!